For a brief review of the show and a slide presentation of some of Moja’s brilliant designs, check out this story in OnCuba Magazine. Moja shares a variety of combs collected from West Africa and discusses their symbolic significance. In this video interview recorded for the Smithsonian Folklife Festival in 2013, Moja discusses her experiences growing up in Civil Rights-era Baltimore, and the insights that both led her to become a designer and influenced her art. Be sure to click on the following link to view another video featuring Januwa Moja on the wearable art of regalia also from the Smithsonian Folklife Festival. 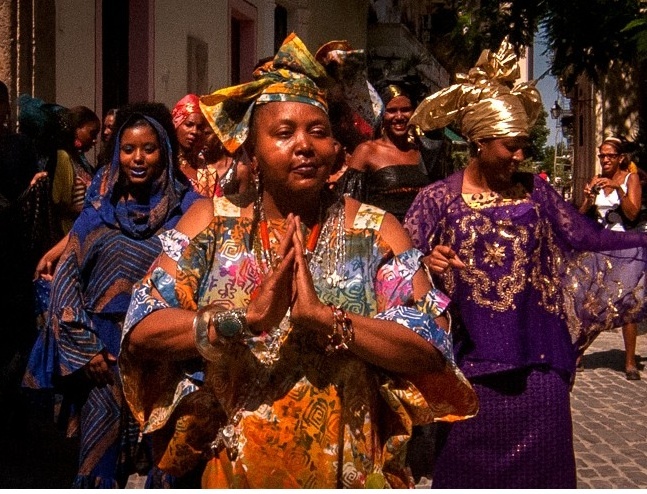 This entry was posted in Fashion and tagged Afican combs, Casa de Africa, fashion show, Havana Cuba, Havana Vieja, Januwa Moja, Old Havana, Smithsonian Folklife Festival, The Day of the African Woman, wearable art, youtube by Ourstorian. Bookmark the permalink. WOW!!! I just came across this. Big thanks and big Ashe’. Send me your address and I will send you the sound track from the show that I put together. Keep doing great things. It is my honor and pleasure to share with my readers the magnificent work you have been creating for decades. Thank you for presenting and representing the power and wonder of our culture through your brilliant designs and creations. ​FYI… Ourstorian is a gift from above.​ ​..